Inside, you’ll wander through THREE well-lit attics … one leads to the next, and the third one leads directly to the garage, which leads to a double basement, and the big surprise in the basement in the entrance to a charming greenhouse. All areas of the house are tied together at an entrance to the kitchen. A great mahogany cabinet that is perfect for storage or to make into a bar Lighting Vintage linens. Hand made afghan blankets, fireplace tools, turntable, vinyl, electronics, audio, turntable speakers, Old family Chessman’s Hill sleds, Mid Century Women’s clothing, costume jewelry, 50s toys, books – many religion based, old garden plow and tools, LOTS of KITCH, old US Military uniforms, skivvies, etc, Army blanket (Ca: 1940s), tools, Van Sciver bedroom furniture, large bags of window curtains (while, ivory and taupe), toys, picture frames (wood and metal – all sizes), 28 x 36, painting, antique chests of drawers, antique dresses, wedding dress, end tables, Bed, easy chairs, antique mirror w/ wooden frame, Standing Philco cabinet model radio Ca. 1930 (“No Stoop, No Squat, No Squint”) , books, small decorative items (many antique porcelain), 22 or 27in 1950’s walking Eegee doll in box, Christmas decorations, matching poster bed, dresser, chest and night stand, Mid-century master bedroom set – cabinet=headboard and end tables, chest, dresser clothes (every-day and dress/brand name suites for all seasons), coats, sweaters, shoes, sheets, towels, pillows, blankets, spreads easy/recliner chairs, sofa, end tables, table lamps, TV stands , book cases, TV Cabinet w/doors, side table TV, miscellaneous books, atlases, vintage slide projector and screen Drop leaf walnut table (hand made from walnut tree in backyard), glassware, crystal and cut glass, dishes, Franciscan dinnerware, small decorative for all seasons, pots, pans, silverware, microwave oven, toaster, electric coffee pot, solid wood Windsor-style kitchen chairs, miscellaneous cleaning equipment, buckets/pails, mops, many small hand tools, saws, drills, gardening tools and hardware. (2) ping pong tables, washer/dryer, American Flexible Flyer Ca. 1960 sleds, vintage/VERY old circa 1900 sled(2), Schwinn bikes Ca. 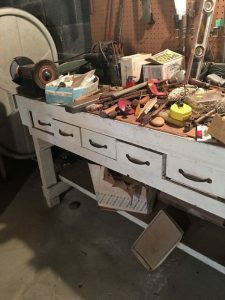 1970, an assortment of larger hand and gardening tools, shovels, saws, bow saws, saw horses, extension ladder, wood pieces, 3’ to 8’ DME / handicapped equipment (bath seat, walkers, potty chairs, etc. ), small vases and decorative accessories, antique display items, lawn chairs, Power mowers/tractor and lawn tools, Philco Model 38-4XX Console Radio.